The embattled outsourcer is fighting them on the beaches with a £550m rights issue. 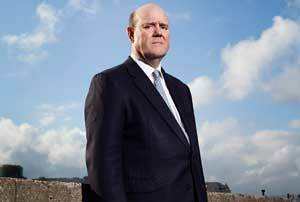 It’s been rather more Somme than sun, sea and sand for Rupert Soames in his first six months as chief exec of Serco. In the last year the beleaguered outsourcer has issued three profit warnings and this morning announced it was writing £1.5bn off the value of the business. Shares plunged as much as 32% to 216.5p. Around half of the write-down will be related to ‘goodwill and other intangible asset impairments’ (the value placed on the brand, for example) and some £450m will be ‘Onerous Contract Provisions’ (capital letters included), the company said. Full year adjusted operating profit will be £130-140m, £20m less than previously expected. No surprise then, that Soames is undertaking some Churchillian measures to get cash flowing again (he is Winston’s grandson after all), pencilling in a £550m rights issue for the first quarter of 2015 and announcing the company was going to try to renegotiate terms with its lenders. ‘While it is a bitter pill, it is better for all concerned that we swallow it now,’ Soames said. An understatement, given how hard investors are finding the news to stomach (shares had already fallen 37.7% in the last year). But it’s clearly better for the still relatively new boss to shake all the skeletons out of the closet now before they start blaming him. Indeed, the company was pretty scathing about its old management, identifying ‘two strategic mis-steps’ - diversifying too far into areas where it didn’t have enough expertise and failing to realise that government contracts had changed to ‘new models that transfer substantially more risk to suppliers’ (it’s still being investigated by the Serious Fraud Office over claims it overcharged the Government for tagging criminals, despite settling to the tune of £68.5m last December). Soames’ proposed solution is for the company to ‘get smaller and more focused, to become the successful, profitable and growing company we aspire to be’. But that won’t provide much short-term succor for shareholders, who are seemingly not so convinced by the positively poetic claim ‘we have been badly bitten, and we will be thrice shy’. It will be more trench warfare than Blitzkrieg for Serco, then. No news, though, on whether Soames is regretting his (rumoured) decision to call up and ask for the job.